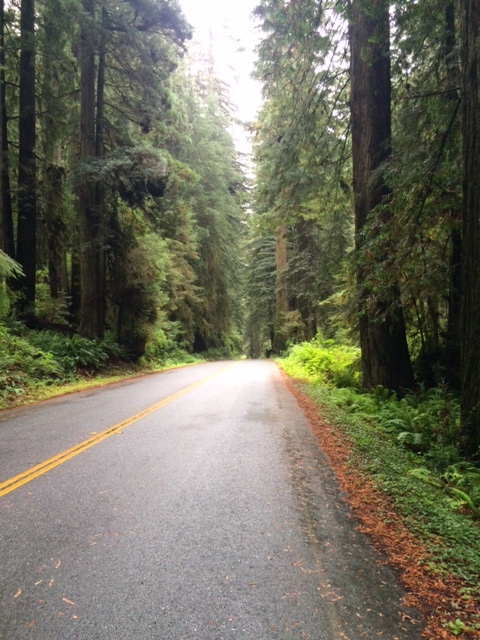 Today I basked in the glory of the redwoods. 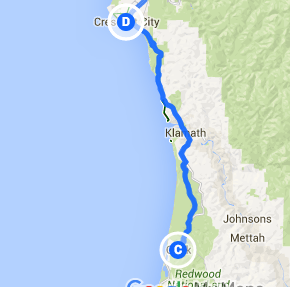 My route was out and back; down the coast to visit Redwoods National Park and then return to Crescent City before heading East tomorrow. 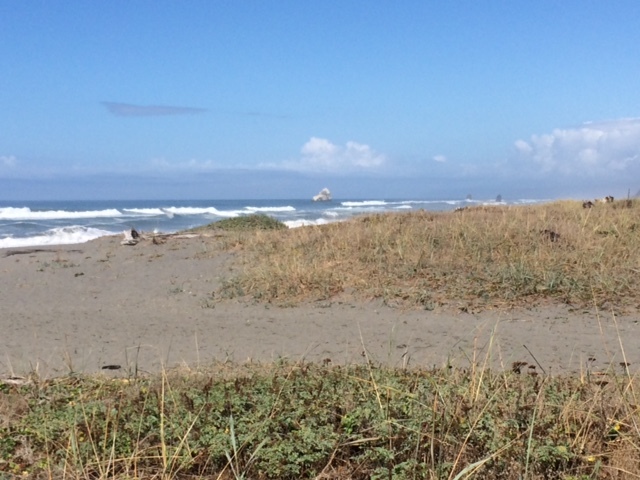 Several locals warned against cycling the stretch from Crescent City to Klamath, 22 miles of gorgeous shore with tight curves and zero shoulder. I followed their advice and took the bus ($1.50 each way, half the passengers cyclists) and continued south from there. This turned a 90+ mile day into a 50 mile day, and it was fun to take the curves on 101 at motor speed. I arrived at Klamath at 8:30 a.m. 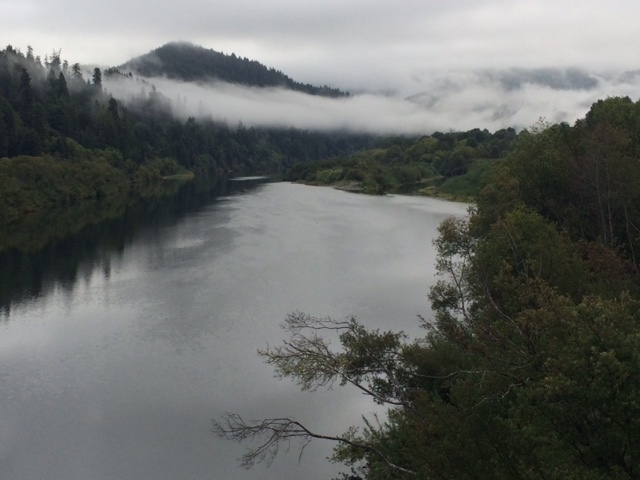 The overnight rain had turned to fog as I crossed the Klamath River. The mountains lay before my like Shangri-La as I began the six-mile trek up 101 and the Drury Road bypass through Prairie Creek State Park. Redwood forests remind me of Hong Kong; impossibly tall structures hovering above a cacophony of ground level activity. I am constantly torn between looking skyward or exploring the dense fauna at eye level. The trees stand so independent, yet so close; a community of solitary objects. 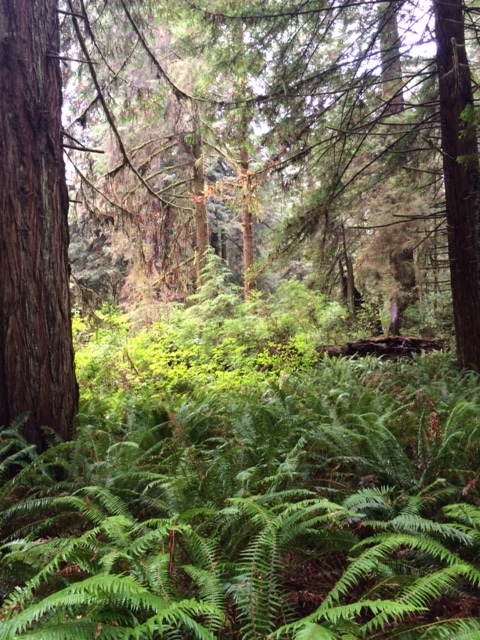 In fact, redwoods have shallow, wide root systems and no taproot. Their foundations are intertwined. They hold each other up. Like us, they are less independent than they appear. 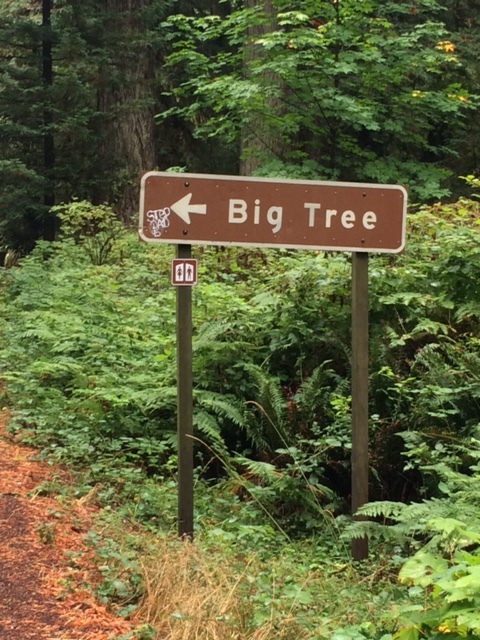 Of course I had to stop at the sign that read, ‘Big Tree’. It is among the grandest: 1500 years old; more than 300 feet tall; over 21 feet in diameter. The base circumference is 68 feet. 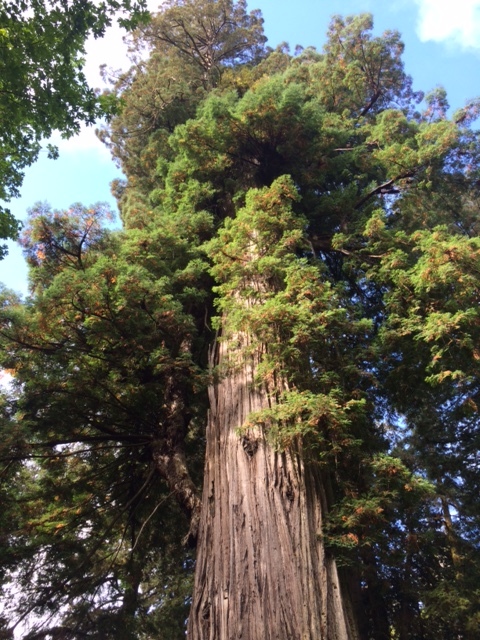 This tree was one of the triggers that propelled the Redwood preservation movement in the early twentieth century when a local tried to cut it down and polish the stump into an outdoor dance floor. The descent along Drury Road was one of my most pleasant glides all trip. 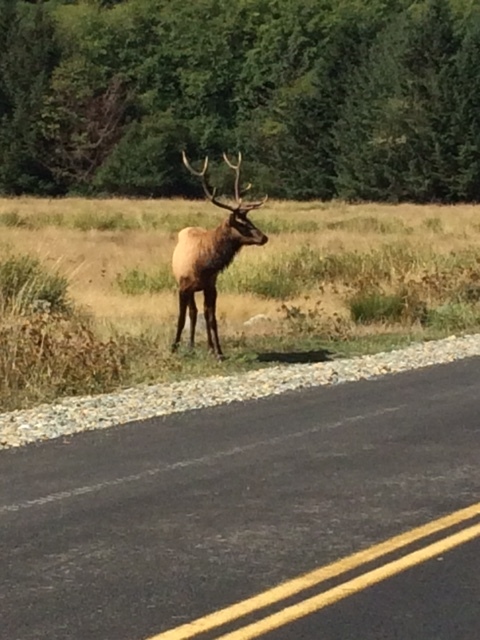 I rolled along at 12 miles per hour with minimal pealing for miles until I arrived Elk Meadow, where a big guy was grazing near the edge of the road. 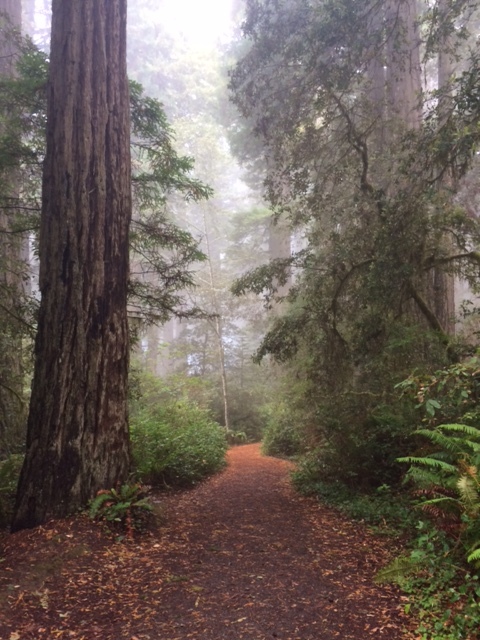 The State of California began preserving Redwoods over one hundred years ago, but Redwoods Naitonal Park wasn’t formed until 1968. 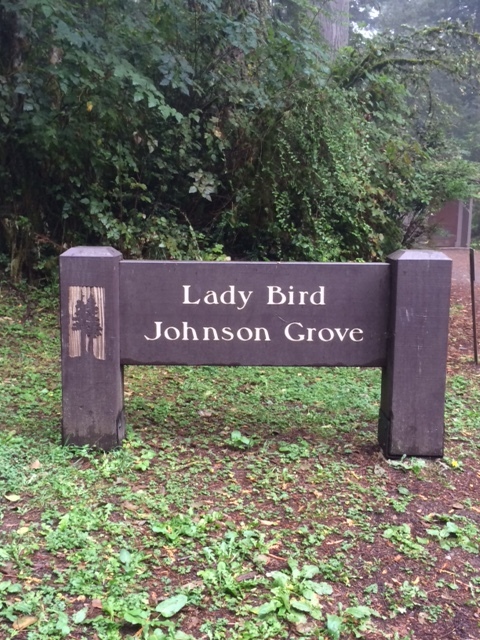 Lady Bird Johnson was an advocate for the park, so I wanted to see the grove named in her honor. 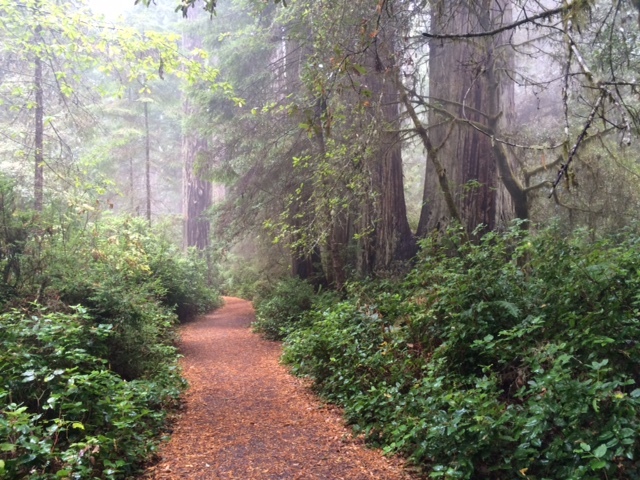 Most redwoods are nestled between the sea and the hills, where they catch the most fog. But Lady Bird Johnson Grove is on a ridge. 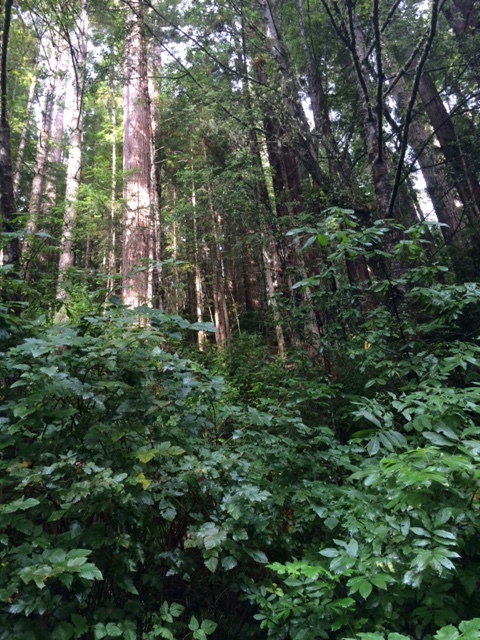 The redwoods are less dense, but the variety of other plants is greater. Unfortunately, it is also a steep climb: 1200 vertical feet in less than three miles. It was worth the effort, and I had a nice break walking my bike along the 1-1/2 mile trail. I am still mesmerized by how these behemoths fall – there seems so little room for them to land. 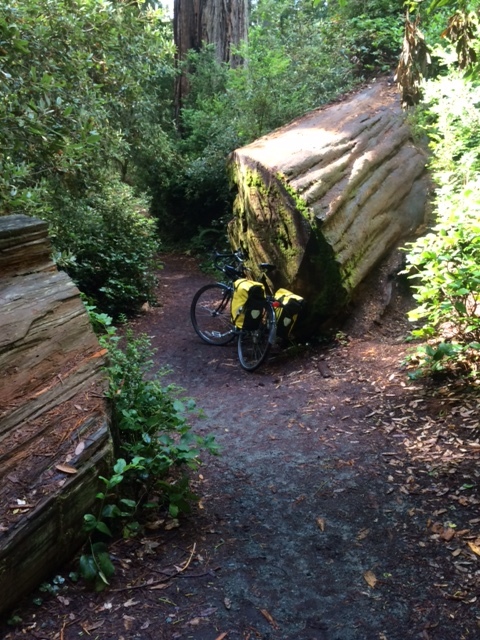 But when they land across a path, the Park Service just cuts a slice through for us to pass. I white-knuckle braked my way down from Lady Bird Johnson Grove, pedaled through Orick and stopped for lunch at the beach, where I met the sweetest couple from West Virginia. The ride back to Klamath was easy. The post-storm winds were mostly at my back though the sky was blue. 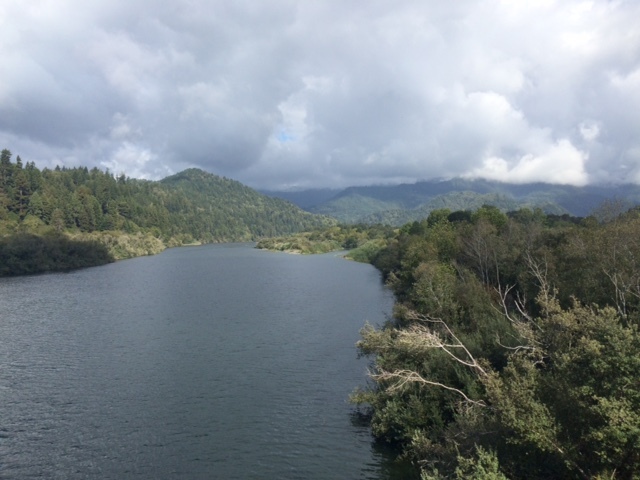 I hiked a few more redwood trails, and took a parting photograph from the Klamath River Bridge. 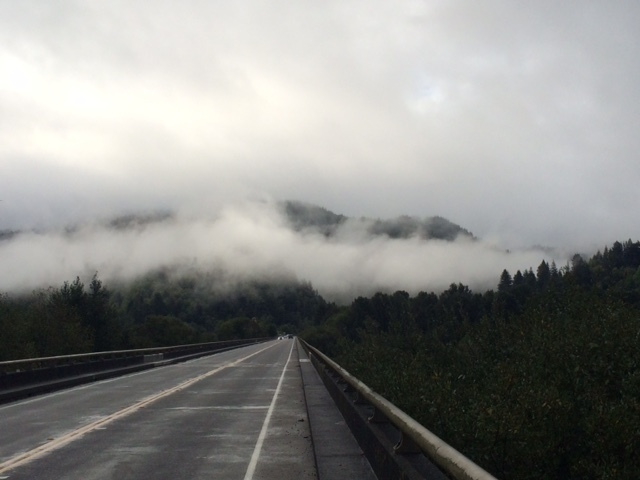 Within seven hours the morning fog lifted, the sun shined, and the late day clouds were setting in.